The Chinese autonomous region Xinjiang in northwestern China covers an area the size of Great Britain, France, Spain and Germany together and still it is a blind spot to most of us. Xinjiang borders on Mongolia, Russia, Kazakhstan, Kyrgyzstan, Tadzhikistan, Pakistan, Afghanistan and India. It is one of the globe’s remotest areas, far away from any sea. Interfering and overlapping cultures cause the area to be historically explosive. News about Xinjiang in the media is about bombing, ethnic clashes between Uyghur and Han Chinese, and explosions. Ethnic tensions arise from the complexity of many factors and cannot be reduced to a bipolar clash between Uyghur and Han or to a growing Islam extremism. 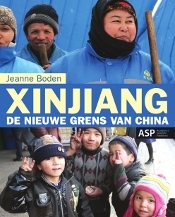 Xinjiang – De nieuwe grens van China (Xinjiang: the new border of China) highlights this complex, remote, explosive area where Han-Chinese, Uyghur, Kazakh, Russians, and many other people search for equilibrium and identity.